On the following pages you will see the most beautiful beaches in Lanzarote, beginning clockwise with Punta Fariones. We would summarize the beaches on this page as being the "wild north"
At Punta Fariones, the little lighthouse at Orzola, you will find the northerly-most beach on the island. Here, there is wild water and currents. One doesn"t see many people here, and it is a beach that is popular mainly with the locals. 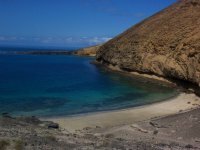 There are also some wonderful beaches on the Isla de la Graciosa, our little neighboring island, which we also regard as being part of the "wild north". Here, of the many beaches, we will only mention Playa Francesa and the picturesque little beach a few yards further that you can see on our photo.